This week, we continued to prepare the team for our last race of the season. Here are some more photos of the team training on the lake. There are also photos of Perle & Bergen that are on loan to us from the Gonsolin Kennel, to help us round out the team. Bergen is an experienced race leader & will help take some of the pressure off Max. The team is working real nice as a unit & they are a real pleasure to run. On the training page, there is a nice video of a portion of one run. This week, we received some new snow along with some very high winds. Although the new snow was welcomed, the winds made it very challenging to keep the trail. This one of the draw backs of a lake trail as it doesn't take a lot of wind to drift up the trail. Yesterday, we had a great speed run on a nicely packed trail. It was great to see the team able to open up. More snow over night, so back out to pack the trail for tomorrows runs. 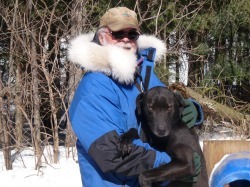 "REGROUPING, REORGANIZING & PLAYING WITH PUPPIES IN THE NORTHERN FOREST!" After the race at Wolburn, it was time to reevaluate the team for the next race of the season. Thanks to Valerie & Laurent Gonsolin, I was invited to go to their place to evaluate the team & work on leaders. I have a lot of leaders in the making, however only one that is real experienced Race Leader with Angel being out for the races after having puppies in December. The race at Wolburn was very stressful on young leaders due to the layout of the coarse for the first mile & the lack of spectator control especially on the second day. The second day my main race leader Max was out due the stress of the first day with the volume of new snow on the trail & the strong winds that at times was blowing the dogs off the non existent trail. On the second day, I experienced many stops to change leaders to get a combination that would finish the race. Due to these problems, I took longer to finish the coarse than expected. Because of this my team was DQ'D as we were over 1.50% cutoff. This rule is never applied at any other races I have attended in over 40 years of racing, other than the first day, as per ISDRA Rules. However, a major weakness this year in the team was experienced race leaders. During my visit with the Gonsolins, they were kind enough to loan me a couple of dogs to finish off the race season & one (Bergen) is an experienced race leader. The training photos highlights our race team for Daquaam. On the Training page is a video of the team training yesterday. Also above is a photo of the team at Wolburn & the puppies running this week. The weather this week was good with a little snow which enabled us to layout a training trail on the lake. "BACK HOME TO THE PEACE & TRANQUILITY OF THE NORTHERN FOREST!" It was great to get back home after a challenging weekend at a race here in Quebec! The weather made for a long tiring trip to the race & the gale force winds & driving snow made tough conditions for Saturday"s event. Sunday, we had leader challenges with experiments with a number of young leaders getting their first experience at a race. Willy & Katie ended up leading us through the last third of the race and did a great job. I have always had the philosophy that if you can't say something positive, don't say anything. With that in mind, I will not say anything more about my weekend! However, I am certainly very appreciative of the assistance of my Handlers, Michel & Ben and the great support of the Gonsolin Family. It was good weather for the trip back home & we made great time. "WEATHER, HUMANS MESS UP TRAILS IN THE NORTHERN FOREST!" The weather this week was again a spoiler with rain Tuesday night, Wednesday & Thursday morning coupled with a temperature drop to below freezing left the trails all ice again. This is normal & with a little snow, the trails will be usable again. However, some irresponsible idiots destroyed the trails with their snow machines running on the trails when they were wet, soft before they could freeze up. These individuals not only ran on the trails, they tore them all up with hot dogging. The trails are now all to dangerous to run the dogs on. It doesn't matter how far you live from civilization, inconsiderate individuals will find a way to screw up things! These individuals have NO RESPECT for anybody or anything! We had beautiful runs on Tuesday with two teams before the inclement weather came in. The photos above are of the Miortuk Team at the race in L'Epiphanie and are provided by Jean-Charles Audette. We will have to find some alternative trails for training for next week to prepare for the race at Wolburn.